There is a growing need for fire alarm and warning systems within the UK today. The Safety Centre have several products which are ideal for use on building sites. The first product that we would like to highlight is a Mobile Fire Extinguisher Point which has a rotary hand bell incorporated onto it. This unit can accomodate two fire extinguishers and can easily be moved to an area of an incident. The rotary hand bell which is located on the frame of the mobile fire point can be used to raise an alarm of a fire situation. A product available from The Safety Centre is the Howler Battery Powered Call Point Alarm. This is ideal for temporary building site fire alarm systems as it can be easily mounted on a wall. 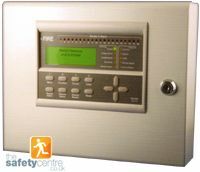 This unit has a traditional call point built into the housing which can be operated to raise an alarm signal. Once operated a sounder within the housing operates and gives the building site workers a warning that the alarm has been activated. These units are suitable for internal and external use. Several of these Howler building site fire alarm systems can be linked together to create a much larger system which operates all the sounders when one of the call points has been activated. This product is entirely battery powered which means that no mains feed is required and that it can be easily moved and relocated as building works take place across the site. For larger building sites that require a greater amount of fire protection The Safety Centre can supply a comprehensive range of Wireless Fire Alarm Systems for Building Sites. These systems comprise of a main control panel which require a mains feed, and further field detectors, call points and sounder units which are completely battery powered. These systems are ideal for building site fire alarm systems as they can be re-used time and again on several projects. These systems can be installed extremely quickly as each detector, call point and sounder device needs only two screws to mount it to the wall or ceiling. Additional radio signal booster panels are also available which allow the radio signal between the devices and panels to be relayed around the site, which means much larger systems can also be created.